CAT-VN advocates for humane treatment of detainees and prisoners in Vietnam and an end to torture and other abuses in Vietnamese prisons, jails, police stations, re-education centers, psychiatric institutions and other places of detention. Ten benchmarks to evaluate Vietnam's progress in preventing and ending torture. CAT-VN sent the following ﻿questions﻿ to the Vietnamese government in December 2013 regarding torture and Vietnam's compliance with the Convention against Torture. To date we have not received a response. An informative video by NRCAT explains why it's important for countries to sign and ratify the Optional Protocol to the UN Torture Convention. John Sifton, Foreign Policy, October 3, 2014. On December 10, 2013, prior to publishing our report on torture of prisoners of conscience in Vietnam, CAT-VN sent a letter to the Ministers of Foreign Affairs and Public Security summarizing the report's findings and asking what actions the government was taking or would consider taking to address the concerns documented in the report. To date we have not received a response. "Prisoners of conscience in Vietnam are patriotic Vietnamese who stand up against injustice and violent power. Instead of listening to them, the authorities use oppression, beating, abuse, discrimination and other means to put them in prison." 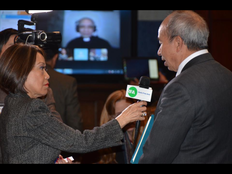 Among those who have testified before the U.S. Congress on Vietnam's human rights record are Catholic priest Phan Van Loi (who testified from Vietnam, by skype) and Rong Nay of the Montagnard Human Rights Organization. CAT-VN's Official Launch in Washington, D.C.
CAT-VN was officially launched on January 16, 2014 at press conference in Washington, D.C., where we released our report on torture of prisoners of conscience in Vietnam. At the press conference, Ven. Danh Tol (left), a Khmer Krom Buddhist monk from Vietnam, testified about being imprisoned and tortured for participating in a peaceful protest for religious freedom in 2007. Tran Tu Thanh (center), a veteran of the Army of the Republic of Vietnam, described the torture he endured during eight years of incarceration in 14 different "re-education" camps. 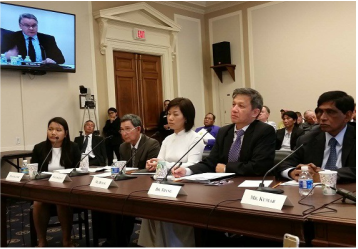 Earlier in the day Tran Thi Ngoc Minh (right) testified before Congress about the beatings and abuse her daughter, labor rights activist Do Thi Minh Hanh, has suffered in prison.